This image, also from the report, clearly speaks to the whole “can’t see past their own walled garden” analogy. 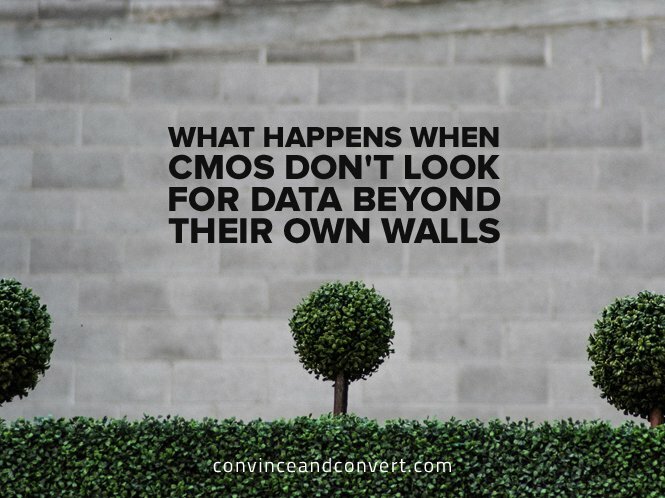 As you can see, 84 percent of CMOs are doing fine and dandy when it comes to using the data they have on their customers as it pertains to their browsing of their website—in other words, inside their own walls. However, problems arise when we step outside of their comfort zone (outside their own walls). 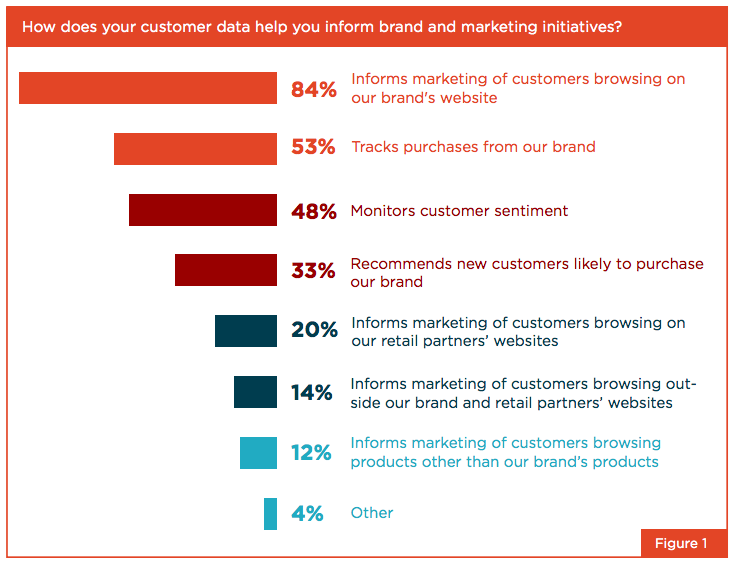 A mere 33 percent say they use their own customer data (first-party data) to find new customers. Using only first-party website data limits the analytics, targeting, and addressability of Data Management Platforms (DMPs). In an article I wrote earlier this year in these hallowed halls about a B2B marketer who walks into a bar with DMP, I wrote how the use of DMPs is growing in popularity. Reasons included providing a centralized control and standardization of existing first-party data, plus developing rich and actionable datasets across first, second, and third-party data sources. In other words, a DMP—the right DMP—can greatly increase the aforementioned 33 percent. The cold hard truth is this: Marketers need third-party data to fully know customers’ context and orchestrate the most meaningful experiences for them. The value of third-party data is in the marketer’s ability to combine it with first-party data to build a deeper customer profile. Today’s data-driven CMO must create a data-driven marketing culture and organize the required people, processes, and systems. Additionally, they need to eliminate data silos, create a single source of truth, and build a 360-degree view of customers to reliably and efficiently target the right message to the right person at the right time. All of this will make the decision-making, planning, and execution of campaigns easier as they follow the customer-journey, enhancing the experience. The end result? Customers feel they are being spoken to, based on their wants and needs. Imagine that—giving them what they want versus what you think they want. What a concept.